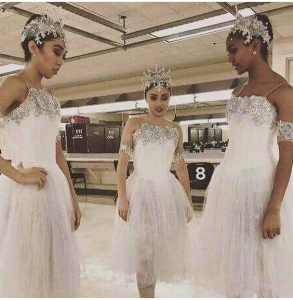 Last month, the International Association of Blacks in Dance’s third annual ballet audition for women of color was expanded to include a separate audition for men. The brainchild of Joan Myers Brown (founder of both Philadanco and IABD), the women’s audition was created to specifically address the lack of black females in ballet. However, the success and attention that audition drew made the men feel left out, so IABD decided to give the men equal time this year. Both auditions happen within IABD’s larger conference, hosted this year by Lula Washington Dance Theatre. The week-long event of panel discussions, master classes, auditions and performances feels part–family reunion, part-retreat. The electrically-charged atmosphere can feel foreign to some white ballet representatives, but it’s an invaluable social education. Experiencing the way in which African Americans gather, interact and educate can explain why walking into a ballet school can feel cold and unwelcoming. This year’s ballet auditions drew some of the original supporting organizations (San Francisco Ballet, Ballet Memphis, Pacific Northwest Ballet, Joffrey, Kansas City Ballet and Nashville Ballet) plus some newcomers (Atlanta Ballet, Oakland Ballet, New York City Ballet), although some chose to attend only the women’s audition. The number wanting to attend at the last minute—and the distinct increase in the level of talent this year—prove the word is spreading. SFB assistant administrative director Christina Gray Rutter shared the success story of Raquel Smith who received a scholarship to SFB’s school at IABD’s first ballet audition in 2015: Now in level 8, she has performed with the company in The Nutcracker, Sleeping Beauty and been asked to learn Serenade. Smith returned to the IABD audition this year. Raquel Smith’s journey to San Francisco Ballet began at IABD’s 2015 audition. In December, she performed with the company in Nutcracker.